When you have a nice balcony, deck or patio you want to enjoy it as much as possible. Especially for city dwelling with tighter living quarters, a balcony offers a welcome extension to the living space.Candles of course add instant atmosphere. The warm flickering glow is romantic and relaxing. But if you want to do a bit more, like read, play cards or enjoy a dinner where you can actually see the food and your guests, a more permanent solution is in order. In rental situations the "permanent" of course still asks for flexibility and relatively low cost. Light strings are of course an easy and inexpensive solution. They are available from simple Christmas lights that you can pick up for a few dollars to more durable and powerful commercial light strings. The lights Finnegan is enjoying above are commercial string lights with 10W incandescent globs bulbs spaced every 12". We strung them in the trees since we had no other way of getting light to our favorite hang-out spot that is away from the roofed-in part of the deck and the house walls. We are now in the process of swapping the incandescent bulbs for LED bulbs, but at $6 each compared to $.50 we are doing it gradually as the others fail. We have one string on each side of the house and each string holds 100 bulbs! We have them on dimmers, so we almost always have them dimmed way down. With a beautiful covered terrace like this I'd take advantage of the large roof and install a few fixtures that bring the light down to a more intimate level. Track lighting as shown is generally too harsh . I could picture a chandelier or a cluster of unique pendants. Outdoors we use the very same principals as in indoor lighting and try to incorporate multiple layers of light. With a hot tub like this one I'd for sure like to be able to enjoy the deck year round, just like these owners do. The recessed deck lights work really well here. They not only illuminate the deck adequately, but create a soft visual boundary to the space. 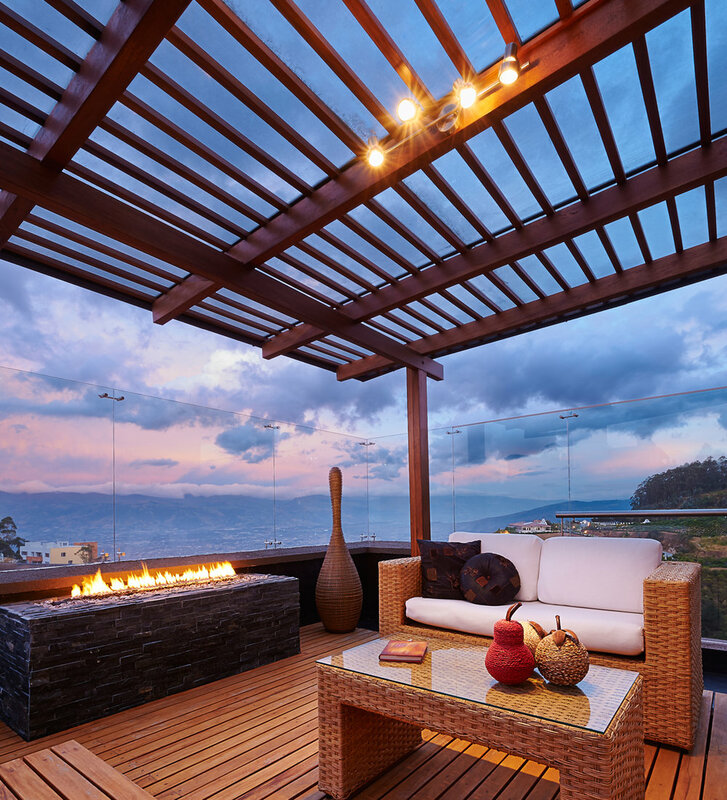 A terrace or balcony expands the living space, not only physically, but also visually. Outdoor lighting helps fight the "black hole" feel of the windows on long winter nights, especially if they are without window treatments. No matter the size, a balcony is a wonderful addition to the living space. Here a string of lights adds the light needed for reading or al fresco dining. Below: Pure joy to view this colorful balcony - even though our feline friend seems to prefer to keep the space to himself.